Software engineers are the technical minds behind computing programs, systems, and networks. Engineers are present at every stage of software creation, including design, development, testing, and evaluation. They also review market research to determine which software products and services are in highest demand, and may need to revisit their work to address glitches and other program errors. Most software engineers are well-versed in computer science and programming, as well as other related fields like web development, digital design, and project management. Software engineers often begin their careers by earning a bachelor’s degree from an accredited college or university. These degree programs cover computer science, programming languages, systems analysis, computing architecture, quality assurance, and database management. Today, many students choose to earn their bachelor’s in software engineering online. Web-based students follow the same rigorous curriculum as their brick-and-mortar counterparts, leading to the same number of job opportunities after graduation. The asynchronous schedule is ideal for students with part-time jobs, childcare obligations, and other responsibilities that could interfere with campus-based learning. Read on to learn more about what you can do with an online bachelor’s in software engineering, and what kind of career opportunities you can pursue after earning your degree. WILL AN ONLINE SOFTWARE ENGINEERING DEGREE PROGRAM PROVIDE ME WITH THE SKILLS I NEED TO ADVANCE MY CAREER? A bachelor's degree is considered the minimum requirement for most entry-level software engineering positions. Students who pursue this degree will learn how to perform key processes at different stages of software creation, along with the fundamental theories that guide this cutting-edge field. Some bachelor's in software engineering online programs culminate with a capstone course, which allows students to demonstrate the knowledge and skills they have gained with a comprehensive research project; other programs require students to submit a portfolio of their best work. WILL AN ONLINE SOFTWARE ENGINEERING DEGREE PROGRAM WORK WITH MY SCHEDULE? The top online software engineering degree programs offer a flexible alternative to traditional education. Online students can download course lectures and readings, participate in virtual discussions with other students, submit written assignments, take exams, and communicate with their professors on their own schedule. WHAT JOBS CAN I GET WITH MY BACHELOR’S IN SOFTWARE ENGINEERING? Most software engineering bachelor’s degree recipients go on to pursue careers directly related to software design and development. According to the Bureau of Labor Statistics (BLS), the most popular industries among software developers include computer systems design and related services, software publishers, finance and insurance, manufacturing, and management of company and enterprises. Others find work as web developers, computer programmers, and network architects. WHAT ARE THE BEST ONLINE SOFTWARE ENGINEERING DEGREE PROGRAMS? 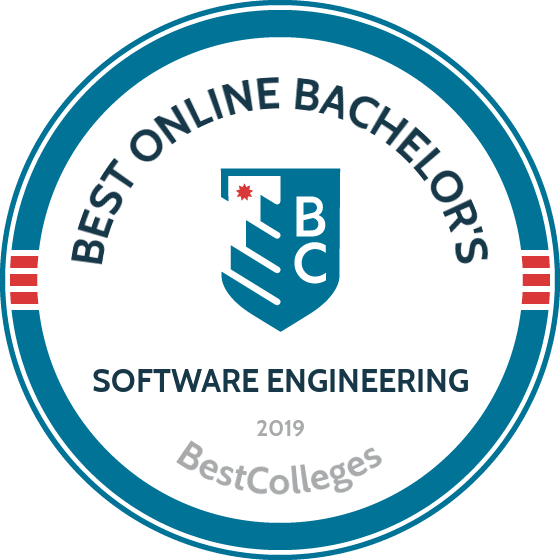 The following ranked list of schools can be a helpful starting point in your search for the best online bachelor’s in software engineering programs in the U.S. If you are considering an online bachelor’s in software engineering, be sure to contact admissions specialists at the schools you are interested in to learn more about their specific requirements and offerings. Western Governors University is a regionally accredited university providing outcomes-oriented education to working professionals. The WGU education model promotes competency-based online education and focuses on degrees that directly address current workforce needs. WGU's bachelor of science in software development prepares students to work in a variety of fields providing programming expertise. 34 courses comprise the online software engineering degree, each focusing on a specific set of competencies that students must prove mastery over before they can move on. Students with prior college experience will take fewer courses and the average number of transfer credits is 31. Through its competency-based model, WGU aims to provide the best online software engineering degree for each student by focusing on the areas of software development and programming that are most important to their career goals. Students choose between a Java or C# track depending on where they ultimately aspire to work; either programming language can provide the necessary groundwork for learning other programming languages. The comprehensive curriculum covers topics like IT fundamentals, scripting and programming, network and security, the business of IT, operating systems, and data management. More than 75% of WGU students complete this online software engineering degree in under three years. WGU is based in Salt Lake City, Utah but serves students throughout the U.S. and maintains universities in eight states. WGU holds regional accreditation from the Northwest Commission on Colleges and Universities (NWCCU). Bellevue University, a private nonprofit regionally accredited university in Bellevue, Nebraska, opened in 1966 and today serves nearly 9,000 students across four states and online. An open-access university, Bellevue University offers over 80 degrees in high-growth fields like IT and education, plus certificates for career advancement. Students enrolled in Bellevue's 127-credit BS in software development graduate with the skills and knowledge needed for in-demand software design and coding careers. This online software engineering degree gives students practical experience designing, building, and maintaining critical software, plus practice programming with Java, Ruby on Rails, and SQL. Bellevue designed its bachelor of science in software development for working professionals looking to advance their careers through a degree. Software development at BU is a cohort major, meaning students progress through the 36 credits and six sessions as a group. This learning model fosters peer support, teamwork, and collaboration, which come in handy for future software developers, project managers, and IT specialists. What's more, coursework for this degree aligns with CompTIA Project+ certification, making Bellevue's program an affordable option for graduates seeking a dual credential. To apply to the cohort, students must complete at least 60 semester hours at an accredited institution of higher learning with a cumulative "C-" grade or better. Transfer students with associate degrees meet this requirement. Applicants also need at least one year of computer programming experience. Brigham Young University-Idaho, based in Rexburg, Idaho, is a private, four-year university affiliated with the Church of Jesus Christ of Latter-Day Saints. The school serves 34,000 students every year with more than 15,000 online learners. The school offers 350 online courses toward 18 online degrees. The BS in software engineering is a 120-credit program that students can take entirely online. The curriculum includes 40 credits of foundational courses, 54 credits in major courses, and 26 in electives. For the major, students study topics like technical communication, computer security, and software design and development. Students must also complete an internship for 1-4 credits, with each credit equal to 140 work hours. Online learners can complete this requirement locally and with their current employer upon approval. Online learners progress through this online software engineering degree together. BYU-Idaho emphasizes collaboration and peer support through the school's learning model, which emphasizes three principles: Class preparation, peer instruction and collaboration, and application of course material. Seniors complete a capstone project where they demonstrate mastery of the design, development, and implementation of complex computer systems. One school year at BYU-Idaho includes three 14-week semesters in the fall, winter, and spring, and one seven-week semester in the summer. Admission to a BYU-Idaho online program requires students to either complete PathwayConnect or have 15 on-campus credit hours from a church educational system school like BYU. PathwayConnect is a one-year program comprised of three semesters that helps individuals begin or return to college. BYU-Idaho holds accreditation from Northwest Commission on Colleges and Universities (NWCCU). Based at Arizona State University's online campus in Scottsdale, Arizona, ASU Online offers over 150 degrees to 25,000 enrolled online learners. Personalized learning environments enable students across the world to receive the professional development and career advancement they seek. Online programs at ASU hold the same accreditation as on-campus programs in Tempe. The BS in software engineering is a 120-credit program that blends engineering, computing, and project leadership. It features a project-driven curriculum that emphasizes engaged learning, discovery-based education, and practical application. Each semester, students complete projects that enhance communication, teamwork, critical thinking, and professionalism. ASU's online software engineering degree prepares students to enter the computing profession or pursue advanced degrees. Online software engineering bachelor degree programs at ASU Online last 7.5 weeks, offer 41 classes, and reserve 45 credits for upper-division major courses. ASU's generous transfer credit policy accepts all accredited college-level courses for which students earn a 2.0 or better. From junior or community college associate degrees, ASU accepts up to 64 semester hours; for accredited four-year institutions, there is no limit. However, the school's residency condition requires students to earn at least 30 credits toward their degree through ASU. ASU holds regional accreditation from the Higher Learning Commission (HLC). Southern New Hampshire University (SNHU) is a private nonprofit university located in the city of Manchester. The school offers career-focused degrees on site, online, and in a blended format. For online programs, SNHU offers more than 200 degrees in areas like accounting, art and design, education, health, and engineering. The SNHU BS in computer science is a 121-credit program available in two concentrations: information security and software engineering. The software engineering track teaches a systematic approach to developing software on time, on budget, and within specifications. The information security track also features a design-based approach, with key courses covering secure programming principles, strategies for reverse engineering software, and cybersecurity concepts. Both concentrations offer four courses comprising 12 credits. In general degree requirements, students explore emerging systems and technologies, apply programming principles, and learn the foundations of mobile software development. Students also learn to program in C++, Java, and Python, deploying on platforms like Windows, Linux, and Mac. The SNHU BS in software engineering accepts up to 45 transfer credits from previous coursework toward an associate degree and up to 90 credits earned from a bachelor's. SNHU does not require SAT or GMAT scores for admission consideration. As for tuition, SNHU strives to keep costs down for online learners; the school froze fees for the sixth time in 2017. Established in 1875, Park University in Parkville, Missouri serves more than 16,000 students hailing from 60 different countries. The school maintains 40 campus centers across 22 states and the District of Columbia, offering over 60 programs, including 45 bachelor's degrees. Park's online department provides flexible online and hybrid courses, which students can pursue with little disruption to other life commitments like work and family. The bachelor of science in information and computer science at Park University prepares students to enter the technology field or pursue an advanced degree. Students can choose from one or more degree specializations, including computer science, network/security, information technology, cybersecurity, data management, or software development. The concentration in software development is ideal for students interested in coding, web applications, and programming languages. First-year students with an unweighted high school GPA of 3.0 or higher are eligible for admission to Park regardless of their ACT or SAT scores. Students below this threshold must meet extra criteria with regards to GPA, class rank, or SAT/ACT scores. Transfer students can apply up to 75 transfer credits from an accredited two-year school. The online program is available in accelerated, eight-week terms with start dates in January, March, June, August, and October. Park University holds regional accreditation from the Higher Learning Commission (HLC). The University of Maryland University College began in 1947 as a branch of the University of Maryland's College of Education. The school's goal is to serve working professionals and their families, including those in the military. UMUC offers more than 90 programs and specializations online, all focused on the development of practical skills that students can apply immediately. Through the 120-credit BS in software development and security, students learn how to use in-demand programming languages and apply best practices in software design and development. Learners work both individually and as part of a team in the design, development, implementation, and testing of software. The UMUC online software engineering degree prepares students to work with multiple programming languages and relational databases; plan, manage, document, and communicate all phases of a software project; and identify and respond to cyberthreats while minimizing risk and protecting privacy. The major is comprised of 11 courses totaling 33 credits, with general education courses and electives accounting for the remainder of the degree. Students can complete the program in less than two years with transfer credits; UMUC allows up to 90 transfer credits toward program requirements. Multiple sessions and eight-week terms allow students to focus on fewer courses at a time and plan around busy schedules, and its quest to replace all textbooks with no-cost digital course materials saves students money. UMUC does not require SAT or GRE scores for admissions. The College of St. Scholastica in Duluth, Minnesota is a private, four-year college affiliated with the Catholic Church and Benedictine order. The school serves over 4,000 students with 60% undergraduates. CSS includes six schools: arts and letters, business and technology, education, health sciences, nursing, and sciences. The online, 128-credit BS in computer information systems prepares students to work in information technology-related careers and offers four concentration options. One concentration is software development, where students study topics like client-side web development, data structures, algorithms, and mobile device programming. Other concentrations include business analysis, cybersecurity, and health informatics. The major itself requires three courses covering CS principles, project management, and systems development. In the final semester, online learners work on a capstone project where teams collaborate on the analysis, design, implementation, and documentation of a complete information system. St. Scholastica's online courses are largely asynchronous but offer synchronous virtual classrooms. Students can complete the online software engineering degree in fewer than three years, though actual time depends on transfer credits and course loads. St. Scholastica also counts work and life experience toward college credit through prior learning assessments. St. Scholastica pairs online learners with a personal adviser to help map out a program of study that attains their goals. Online students also have access to the same student services available to on-campus students, such as counseling and tutoring. The College of St. Scholastica is accredited by the Higher Learning Commission (HLC). Established in 1915, Washington State University Everett brings baccalaureate and graduate degrees to the North Puget Sound region. The campus focuses on business, communications, and engineering, and expands WSU into the Snohomish, Island, and Skagit counties in support of the state's economic development needs. WSU Everett's bachelor of science in software engineering is a full-time, synchronous degree-completion program that students can finish in 2.5 years. Online courses and labs are taught by WSU faculty in Everett and streamed to learners through interactive video. Prospective students must transfer in with general education credits already earned. The program helps students acquire the skills and knowledge necessary to work in the modern technology industry. Graduates can find employment as software developers, engineers, project managers, and quality assurance specialists. Courses concentrate on the development, testing and validation, maintenance, security, management, and integration of software. Students also develop a technical background in math, science, and engineering and gain practical experience through labs, courses, and a capstone project. To enroll in WSU Everett's software engineering major, students must apply for formal acceptance at the end of their sophomore year or the start of their junior year. Students must complete 26 semester hours, including prerequisite courses in the areas of physics, statistics, economics, English, and math, before admission. Applicants must earn a "C" grade or better for all prerequisite courses and have a minimum cumulative GPA of 2.5. Washington State University Everett is accredited by the Northwest Commission on Colleges and Universities (NWCCU). With campuses in Naples and Fort Myers, Florida, Hodges University enrolls more than 1,500 students in bachelor's, master's, and certificate programs. Hodges is a private university committed to serving the southwest Florida community and beyond through on-site and online learning. One of Hodges' distance education degrees includes the bachelor of science in software development. This 120-credit online software engineering degree can take students with no transfer credits just under four years to complete. Typically, students enroll in 12 credits per session at three sessions per year for three years. One additional session takes place during the fourth year. Once enrolled, learners take 36 credits of general education courses and 36 credits each of software development and computer information technology. Students also take 12 credits of approved electives. Courses include advanced database management, principles of information security, internet application programming and databases, and organizational applications of social media and collaborative technologies. As part of their educational program, students also earn industry recognized programming language certifications, including A+, MOS, and ICCP C++. Hodges University holds accreditation from the Southern Association of Colleges and Schools Commission on Colleges (SACSCOC). DePaul University in Chicago, Illinois is a private, nonprofit doctoral university serving more than 22,000 students a year. Founded in 1898 by members of the Congregation of the Mission (Vincentians) and named in honor of St. Vincent de Paul, DePaul is the nation's largest Catholic university. DePaul's BS in computer science teaches students the basic computing vocabulary they need to navigate an evolving field. Students learn to work with algorithms, programming languages, and computer systems. The concentration in software development is a 192-credit program with 48 courses. It is one of two undergraduate programs available to online learners; the other is in information technology. To graduate, students must earn a "D+" in all major and minor courses and two required courses in composition and rhetoric. This program also requires two capstone courses, one in the student's sophomore year and one as a senior. Courses in the third year delve into database systems, operating systems, automata theory, the theory of computation, and agile software development. The senior capstone project, meanwhile, takes place in the final semester and helps students gain experience collaborating as a team on a large software project. This bachelor's degree in software engineering online is open to transfer students as a degree completion program. To apply, prospective students must have at least 45 quarter or 30 semester credits to transfer. They also must have taken one semester of either Java or C++ for a grade. DePaul University holds accreditation from the Higher Learning Commission (HLC). A public university located in State College, Pennsylvania, Penn State is one of the largest universities in the United States. In 1998, Penn State launched Penn State World Campus, a distance education arm that now offers more than 60 academic programs, including a bachelor of science in software engineering. This 126-credit undergraduate program requires four years to complete. Applicants must hold a minimum 2.7 GPA from high school transcripts, but they do not need extensive work experience to qualify. Once enrolled, students gain exposure to computing skills, engineering principles, software construction, and project leadership. World Campus learners explore problem-solving skills and state-of-the-art technology through a combination of software development experience, classroom study, and design projects. The core curriculum consists of 86 credits of prescribed courses, six credits of additional courses, and nine credits of supporting courses, plus general education and electives. Online learners use interactive software that incorporates email, collaborative work, discussion boards, and group work facilitation. Asynchronous coursework offerings mean students complete assignments at their own pace. The curriculum includes software engineering courses, such as discrete mathematics and probability, statistics, computer programming, software design, object-oriented methodology, and software validation and verification. During their senior year, students take a series of capstone courses that culminate in an industry-sponsored design project. Pennsylvania State University holds accreditation from the Middle States Association of Colleges and Schools (MSA) and programmatic accreditation from the Engineering Commission of ABET. Founded in 1878 in Burlington, Vermont, Champlain College offers degrees and certificates in more than 80 programs online and on campus. Champlain serves about 2,200 full-time undergraduate students. One of Champlain's online undergraduate degrees, the bachelor of science in software development takes place fully online with no on-campus requirements. Admission to the program means students must demonstrate professional and personal goals that line up with degree outcomes. Applicants should prepare to discuss their academic background, future plans, and current and previous work experiences. Champlain offers six start dates per year. The bachelor's in software development requires 120 credits for completion, and it takes full-time students who start with no previous college credits about four years to complete Champlain delivers its courses in a seven-week accelerated format. Courses include foundational subject knowledge and takeaways that students can apply to their jobs in the field. Learners enroll in classes like information systems analysis and design, operating systems architecture, principles of project management, and C++ programming. As part of the program, students also take 57 credits of general education courses, including technical writing, discrete mathematics, and writing in the workplace. Students may also earn a certificate in C++ programming, Java programming, software development, or Visual C# during their course of study. Champlain College holds accreditation from the New England Commission of Higher Education (NECHE). Located in the rural community of Fayette in the northeast corner of Iowa, Upper Iowa University enrolls about 900 on-campus students. UIU's robust distance education program includes an online component and 15 centers across the U.S. and in two international locations. In total, UIU boasts about 6,000 students. Among this private, secular university's approximately 40 majors is a bachelor of science in software engineering with concentrations in informatics and visualization and graphics. This 120-credit program takes students with no previous college coursework about four years to complete. The degree exists as part of the Organizational Information Systems and Technology Program (OISTP), which includes several other technology-related majors and concentrations. Courses in the software engineering major include human-computer interaction, data structures and algorithms, application and interface design, and game design and programming. By enrolling in the school's eight-week terms, students can focus on a few classes at once. UIU began experimenting with distance education as early as 1973. Today, its online programs provide flexibility and global access to a UIU education. The bachelor of science in software engineering requires no on-campus coursework. Students simply enroll at the beginning of any eight-week term or at the start of the six-week summer term. Faculty members teach courses asynchronously so students can log on from anywhere and at any time. Upper Iowa University holds accreditation from the Higher Learning Commission (HLC). Situated in Augusta, and part of the public University of Maine system, the University of Maine at Augusta serves as a regional state university, enrolling about 6,000 students. UMA's distance education programs include a long-standing online offering for the Maine Army National Guard unit stationed in Kandahar, Afghanistan. Online degrees include a bachelor of science in computer information systems with a concentration in software development . This 121-credit undergraduate program nests within a larger computer information systems degree structure at the university. Students who elect this program prepare for careers as programmers, analysts, information system developers, network administrators, and information technology managers. Throughout the program, learners acquire skills that can equip them for success in information systems. These skills include business fundamentals, project management, systems integration, and systems analysis and design. Students take 87 major credits along with their general education and elective courses. These major credits include courses in programming fundamentals, database design, applied linear algebra, and principles of human-computer interaction and user design. In addition to the minimum credit requirements, students must pass a writing intensive course, maintain a cumulative GPA of 2.0 or higher, complete 30 credit hours of residency courses, and keep a 2.0 GPA or higher within the major itself. Applicants must submit an online application or use CommonApp. Transfer applicants with 60 college credits or more only need to submit their college transcripts. Others must also submit high school transcripts. University of Maine at Augusta holds accreditation from the New England Commission of Higher Education (NECHE). Located in Macon, Georgia, Middle Georgia State University maintains five campuses throughout the heart of the Peach State. The school began in its current form in 2013 thanks to a merger between Middle Georgia College and Macon State College, but its heritage traces back to 1884 through the legacy of these institutions. Today, MGA serves nearly 8,000 students on its campuses and through distance education. Online students can enroll in MGA's bachelor of science in information technology with a concentration in software development. Students must complete 120 credits for degree completion, which takes about four years to finish. With tuition varying between $150 and $199 per credit hour, MGA's program may be one of the cheapest online software engineering degrees available. Although the full program costs less than $19,000 in tuition, students can save money by taking CLEP tests, passing DSST tests, or transferring credits earned at another institution. MGA also offers cost-saving credit for prior qualifying educational or work experience. Once enrolled, learners take courses in general education, information technology, and software engineering. Classes may include robot programming, human-computer interaction, systems analysis and design, and legal and ethical issues in IT. Coursework concludes with a senior capstone project. Middle Georgia State University holds accreditation from the Southern Association of Colleges and Schools Commission on Colleges (SACSCOC), and its information technology degree holds programmatic accreditation through the Computing Accreditation Commission of ABET. Formerly known as Tri-State University, Trine University began in 1884. The school's main campus sits in Angola, Indiana, and it operates satellite campuses across central and northern Indiana, with an additional campus in Centreville, Michigan. Trine offers numerous online degrees at all academic levels, including a bachelor of science in software engineering. One of the best online software engineering degrees in the country, Trine's program requires 128 credits and takes new students about four years to complete. Like other online software engineering bachelor's degree programs, Trine's software engineering degree focuses on computer programming. Distinctively, however, this program also includes techniques, methodologies, and tools for software lifecycle management. Trine's bachelor of science in engineering degree coursework emphasizes both theory and practice, including elements in usability, reliability, cost effectiveness, and modeling and analysis. Students take 44 credits of general education, 75 credits of program requirements, and nine credits of additional requirements. Program courses include client-side database development, object-oriented C++, engineering economics, and contemporary issues for engineers. Students also enroll in labs for microcontrollers, digital systems, and embedded systems. The internship or cooperative work component, which students complete by writing a formal report that details the technical aspects of their work, provides students with hands-on experience in the field. Applicants need to submit ACT or SAT scores along with their transcripts to apply. Trine University holds accreditation from the Higher Learning Commission (HLC), and its computer engineering degrees hold programmatic accreditation through the Engineering Accreditation Commission of ABET. Founded in 1960 as a public institution and part of the Florida State College System, Eastern Florida State College enrolls about 25,000 students each year on campuses in Titusville, Cocoa, Melbourne, Palm Bay, and online. The college boasts one of the top graduation rates in the 28-member Florida College System, and it maintains the highest graduation rate among Central Florida's community and state colleges. EFSC offers numerous online programs, including the bachelor of applied science in program and software development. This online software engineering degree prepares students for entry-level careers as software developers, computer support specialists, database administrators, and web developers. Learners can take classes in flexible formats, such as day, evening, online, and blended courses. Upon graduation, EFSC students should demonstrate knowledge of modern programming languages and data structures, including the ability to design and write documented and organized computer programs. Prospective students need an associate degree with 60 credit hours for admission into EFSC's online software engineering degree. Typically, this degree includes 36 general education credits. Applicants with fewer credits may need to take more hours at EFSC. Associate degree transcripts should also show 21 credits of technical electives. Once enrolled at EFSC, students take courses in object-oriented programming, application development for mobile devices, applications in information security, and information analysis systems and design. Learners also complete a three-credit internship during their last semester. Eastern Florida State College holds accreditation from the Southern Association of Colleges and Schools Commission on Colleges (SACSCOC). Rogers State University began in 1909 as a preparatory school. Today, RSU thrives as a public, regional university headquartered near Claremore, Oklahoma. RSU educates more than 4,300 students through three campuses and in a distance education program online. The university offers associate degrees in 13 disciplines and bachelor's degrees in 17 disciplines. One of RSU's online bachelor's programs includes the bachelor of science in business information technology with a software development and multimedia option. RSU's bachelor's in software engineering online degree helps students take advantage of the growing demand for information technology specialists who possess strong communication skills and a keen business sense. Students learn about software engineering, object-oriented technology, emerging technologies, and multimedia and web development. Graduates with this degree can become computer programmers, web programmers, software engineers, or systems analysts. Whatever their career choice, RSU graduates possess the tools necessary to serve as business-minded, analytical communicators with a deep knowledge of software development and computer programming. Applicants coming straight from high school and transfer applicants with fewer than 24 credits must submit ACT scores and transcripts to apply. Transfer applicants with more than 24 credits should contact the school to learn more about RSU's transfer matrix. Once enrolled, students complete 124 credits, including specific general education courses, core requirements, and specialization classes. Courses include emerging technologies, advanced web systems development, computer architecture, and human-computer interface development. The program concludes with a practicum and a capstone. Rogers State University holds accreditation from The Higher Learning Commission (HLC). Sam Gavis-Hughson, founder of Byte by Byte, helps software engineers interview for jobs at top tech companies. He is the author of "Dynamic Programming for Interviews," an e-book that shows how to succeed at dynamic programming interviews. Through his blog and free content, Sam has helped thousands of students -- and 40+ coaching clients -- land jobs at Google, Amazon, Microsoft, Bloomberg, and Uber. Why did you choose to earn a degree in computers? Was this a field you were always interested in? I knew that I wanted to be an engineer for a long time. Math and science were always something I enjoyed doing. Originally, I thought I would be a mechanical engineer. But I realized that I really enjoy making the systems that actually control the robot. I learned that software was the way to do that. I played around with programming for a while but didn't know I wanted to study computer science until I took my first course. I thought it sounded interesting, but it wasn't until my first course that I was totally hooked and fascinated by it. My job search began well before I completed my degree. I had interviews every week for the entire fall semester, beginning in August. I would have one or more interviews every single week. Going into it I didn't feel prepared, but having so many interviews allowed me lots of time to practice. I got more comfortable with it as time went on. Schooling did not prepare me for industry, but it gave me the basics. What did prepare me for industry was internships. There is so much specific technology (and things to learn for each company) that there's no way you're going to learn it all in school. But if you focus on the fundamentals and learn new skills, that's the big thing. Doing internships will give you a general knowledge of how software engineering works before you go into your career. When I was working as a software engineer, the biggest challenge I had was the vast layers of complexity that you need to understand. If you don't understand, it can be very difficult to figure out what you're doing. Because of that, you have to be really comfortable asking for help or else you will waste a huge amount of time. My current job is challenging because there is no one to hold me accountable and there are no safety nets. I run my own business, so I have to get up, figure out what to do, and do it. I don't get a regular paycheck, so if I want to get paid and put food on the table, I have to go out and get a new client or sell a course. That's how I earn money. It's exciting, but it's also a rollercoaster. How is the job interview process for software engineering jobs different from the process for other jobs in computing? How have you seen the process change over time? The big thing with software engineering jobs is that you are going to be expected to code in your interview. Even with other sorts of jobs in software engineering, you should expect to code in some way and some form. There's been a lot of backlash recently to whiteboard interviews. You're seeing a variety crop up. You're seeing things like take-home tests, pair programming, and different sorts of evaluations. But it all really comes down to the same thing. It's all the same fundamentals at the end of the day. So if you prepare for one type of interview -- like whiteboard interviews -- and you prepare strategies for that like we talk about on Byte by Byte, then you are going to have the skills you need, regardless of the type of interview you're doing. I always recommend talking to your recruiter. Ask the recruiter ahead of time what type of interview you're going to be doing. Your recruiter is your ally, and they're incentivized to help you get the job. When I was in college studying computer science, the people we looked up to were startup founders. People like Mark Zuckerberg, Steve Jobs, Sergey Brin, Larry Page … it was this romantic thing to start a huge company. That's what initially got me interested in starting a business. What really sealed the deal for me was that I love doing so many different things. I really enjoy software development, but I also like problem-solving. Problem-solving is the core of programming, but it's also core in business. I do coding and problem-solving with my coaching clients, my website, and business. As a creative person, it helps me to exercise my brain and do so many different interesting things. What advice would you give to students who are considering a degree in software engineering? The number one thing I tell people is do not do it just for the money. If that is your main reason, you will be miserable. You can start out right away making a six-figure salary, but it's a lot of effort. With software engineering, you are depending on the way your mind works. That means it can be really easy or really hard. If it's hard for you, you will be slower than everyone else, and it'll be really hard. If you find yourself decently good at programming, then I would consider it. For me personally, I was inclined to try projects in my free time and that got me excited. But I put in more work than other people who weren't as interested. Software engineers are an intense group of people. Many do not just do the main job but side projects as well. They work long hours, and it's not easy money. This is something you should do only if you really enjoy it and are excited about it. WHAT ELSE CAN I EXPECT FROM AN ONLINE BACHELOR'S IN SOFTWARE ENGINEERING PROGRAM? Accreditation There is no formally recognized accreditor for bachelor’s programs in this field. Please refer to an individual school’s regional or national accreditation status. The cybersecurity track prepares graduates to protect databases and valuable information against cyber threats. Typical coursework includes network security, cybersecurity, and database management. Students learn contemporary threats to cybersecurity and can find work in government agencies or the private sector. In this concentration, students learn to design, maintain, and protect databases that safeguard an organization's information. Many students who earn this concentration end up in lucrative positions with private sector companies. Typical courses include SQL database design and network administration. Many software engineering programs are actually computer science programs with software engineering concentrations. The concentration provides future engineers with a broad grounding in topics such as C++ programming, Unix/Linux programming, database administration, and project management. This concentration provides students with a comprehensive understanding of connections and communications between computers. Graduates can design, operate, and maintain both wired and wireless networks. They often find work in administrator positions with private sector technology companies, although opportunities also exist in the public sector and with government agencies. Some software programs also allow students to specialize in hardware. This concentration teaches students to design hardware and spend time working with electronics. Graduates of this concentration can build hardware systems while also demonstrating software skills. While individual courses differ from school to school, most software engineering programs offer a similar set of core classes because they all prepare graduates for the same industry. Below, we discuss five courses that most programs include. Microprocessors: This course covers topics relating to microprocessors, including microprocessor architecture and applications, subroutines and the stacks, and memory system design. Operating Systems: This course discusses resource management in the context of computer systems. Students learn the ins and outs of different operating systems. Data Structures and Algorithms: This course covers different computer science and mathematical fundamentals. Possible topics include graphs, sets, recursion, algorithm analysis, trees, and data structures. Management: General management courses help students round out their skill sets. In many cases, software engineers who excel in entry-level positions end up in management roles. These courses offer preparation for those roles. Capstone Project: Many software engineering curricula end with a project. In most cases, the project involves group work and the synthesis of everything students learn during the program. How Long Does It Take to Get an Online Bachelor's in Software Engineering? The primary factor affecting how long it takes to get an online bachelor's in software engineering is whether or not a program follows a cohort model. In a cohort model, students benefit from the support of a peer group, taking the same set of courses with that same set of peers. This model follows a set class schedule, which provides students with more defined completion times. On the other hand, asynchronous, self-paced programs offer a wider variety of completion times, as students can choose how much work they do each semester. As a result, students who take heavy course loads can complete their programs more quickly than students in cohorts. Of course, students who take lighter course loads will not finish as quickly. The typical online software engineering bachelor's program includes 120 credits and requires four years of full-time study to complete. This section provides a list of skills and competencies you can expect to gain in a software engineering program. These abilities go beyond book knowledge and can enhance your employability. Project Management: Since most software development projects require a manager, students in software engineering programs often take courses in project management to ensure they can thrive in that environment. Graduates of these programs can manage, organize, and plan software-related projects. C++ Programming: Most software programs provide students with a thorough grounding in object-oriented C++ programming, often covering the requisite material in two courses. Graduates can solve real-world problems using C++. Database Management: Students in software engineering programs typically learn how to design, maintain, and protect different types of databases. This skill prepares graduates for professional database management and cybersecurity positions. Collaboration: Collaboration is a soft skill, but many programs include group projects in software design to prepare graduates for success in software development. Linux/Unix Programming: In addition to C++, many programs also include courses that teach students how to program in Linux and Unix. These courses provide students with a second programming language to add to their resumes and GitHub profiles. Typical requirements for an online bachelor's in network security or software engineering include fieldwork and a capstone experience. In most cases, students complete fieldwork through either an internship or practicum course in which they gain direct experience working at a software engineering or network security company. Capstone experiences usually include a group project that has students design software or a written thesis. Oracle Certified Associate | Database SQL: Future database administrators can benefit from Oracle's Database SQL certification, which demonstrates competency in fundamental SQL programming language concepts. Competencies include queries, updating and deleting SQL statements, data modeling, indices, and normalization. Professionals earn this certification by passing a comprehensive exam. Oracle Certified Associate | Database PL/SQL Developer: Taking the Database SQL certification a step further, this certification adds PL -- a procedural language that serves as an extension to SQL, the industry standard -- to the mix. Professionals earning this certification demonstrate a thorough knowledge of PL/SQL, which allows them to build database-centered internet applications in modern Oracle platforms. Professionals must pass an exam in order to earn the certification. Oracle Certified Associate | Java SE 7 Programmer: Because Java currently holds the crown as the world's number one software development platform, earning this certification can provide software engineers with a leg up on their competition when applying for jobs. This certification requires professionals to complete a hands-on preparation process before passing a comprehensive Java exam. The BLS projects that jobs in the computer and information technology sector will rise 13% between 2016 and 2026, resulting in approximately 557,100 new positions. Furthermore, computer and IT professionals face low unemployment rates due to the high public demand for tech products and services. This table features the unemployment rates for software developers, as well as eight other computing and IT occupations. All nine entries were included on the Best Technology Jobs list published by U.S. News & World Report in 2016. It is important to note the unemployment rates for all nine jobs are significantly lower than the national unemployment rate for all industries, which is currently 3.9%. According to the 2017-2018 PayScale College Salary Report, students that graduate with a bachelor’s degree in software engineering earn a median annual salary of $66,300 during the first five years on the job, and $104,300 after 10 years in the workforce. The next table looks at career salary growth projections for five of the most common careers for software engineering majors. Students who graduate with a bachelor's in software engineering will be qualified for dozens of entry-level and mid-level positions, although your eligibility for specific jobs will depend on additional factors, like employer type and location. Below, we reviewed four common career pathways in software engineering. Software Developers: Software developers create the blueprints for computer programs, games, applications, and other software-based products. They often conduct market research in order to develop software that matches consumer needs, and will also beta-test their work and perform post-project evaluation to ensure that designs are in working order. Computer Network Architects: Network architects specialize in creating different types of network systems, including small networks (also known as local area networks, or LANs) intended for light traffic and large-scale networks (known as wide area networks, or WANs) that can accommodate a large number of users. Architects also design tools and components that accompany networks, such as firewalls and other security programs, and will often be responsible for performing network upgrades. Computer and Information Research Scientists: This specialized branch of science covers programming languages, software engineering, information systems, network security, and other cutting-edge areas of computing technology. Computer and information research scientists dedicate most of their time to research. They often publish articles in academic journals and present their findings at conferences and industry seminars as well. Web Developers: Web developers design and evaluate the look and functionality of different internet-based programs, tools, and applications. Back-end developers handle code sequencing and other technical site components, while front-end developers are responsible for optimizing the site's layout, graphics, multimedia, and sound quality. Professional organizations offer a great entry point for students who want to learn more about their chosen career path. Below, you’ll find three of the country’s most prominent organizations established for software engineers. These organizations host networking events, provide online trainings, maintain active job boards, and offer other services for career-ready college graduates. Institute of Electrical and Electronics Engineers: The IEEE represents nearly 400,000 members in more than 160 countries. The institute is open to students, established professionals, and retirees. Member benefits include discounts on continuing education courses, a complimentary subscription to the IEEE’s flagship Spectrum magazine, and information about networking opportunities. Association of Software Professionals: The ASP is a trade organization dedicated to software developers and engineers who design programs, apps, and networks. The website features an extensive calendar of upcoming conferences and events, along with full issues of the ASPectsmonthly newsletter. International Association of Engineers: The IAENG offers free membership for students and professionals. This nonprofit also operates 16 societies that oversee niche areas of software engineering, such as bioinformatics, data mining, operations research, and wireless networks. Members and nonmembers are also invited to submit entries for Engineering Letters, IAENG’s flagship academic journal. Approximately two-thirds of today’s college students rely on loans to fund their education, but there are plenty of overlooked financing options you can use to reduce your overall student debt. Financial aid for online learning is equivalent to what you’ll find for campus-based learning. Learn about the different funding opportunities available to online students. Online programs can provide an affordable and flexible option for women trying to balance the demands of work, family, and earning their degree. We’ve curated a list of valuable scholarships specifically for women. Online college programs can be a flexible, affordable option for single parents who are interested in earning a degree and securing their family’s financial future. We’ve compiled a list of scholarships, grants, and other financial aid options geared toward single parents.